The minister Fujiwara no Fusazaki, a son of Fujiwara no Fuhito (or Lord Tankai), arrives at Fusazaki in Shido-no-ura Bay in Sanuki Province (present Kagawa Prefecture) to hold a memorial service for his deceased mother. When Fusazaki’s retinue arrives at Shido-no-ura Bay, they meet a certain woman diver. After exchanging words, Fusazaki’s retainer asks her to dive in the ocean and cut seaweed. Being reminded by the request, the diver tells them of an event that occurred in the bay. “The Jewel of Menkō-fuhai-no-tama” which was offered when a sister of Lord Tankai became the empress of the T’ang Dynasty, was stolen by Ryūgū (the Dragon King’s Palace). Lord Tankai traveled incognito and stayed in this bay to get the jewel back. A diver in this bay eventually had a baby with His Excellency. In order to make her son the heir to Lord Tankai, she sacrificed her life to go to the Dragon King’s Palace and brought the jewel back. Through the narrative, the diver imitates the scene in which the jewel was brought back from the undersea palace. Then finally, she reveals that she is the mother of Minister Fusazaki, passes a letter to him with tears, and disappears in the ocean. Reading her letter, Fusazaki understands that in the underworld his mother desires salvation. He performs her thirteenth-year memorial service at Shido-ji Temple and consoles his mother. Then, while reciting the Lotus Sutra, his mother, who is transformed into a Dragon Lady, appears. She dances gaily and expresses her delight at attaining Buddhahood. The highlight of this drama is definitely the scene where the diver brings back the jewel from the Dragon King’s Palace. 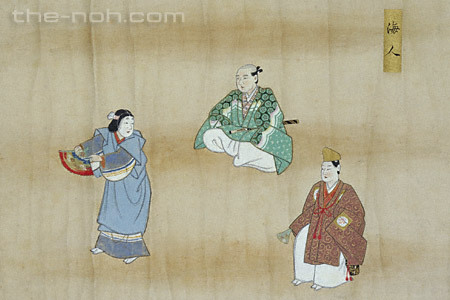 This scene is especially recognized as “Tama-no-dan (the Scene of the Jewel),” known for its great chant and dance. The woman diver holding a sword in her hand jumps into the Dragon King’s Palace, takes back the jewel, which is protected by the Eight Great Dragon Kings, from the sacred jewel tower, and cuts under her breast to hide the jewel in her gash. Because of the Dragon’s Palace’s taboo to avoid the deceased, not even evil dragons approach her. Then, the woman diver pulls the safety rope... The zeal of the diver who is willing to cast her life aside for the sake of her son and her mission is dramatically expressed through the chorus and dance. You might have an impression that the whole piece was created for the sake of showing this “the scene of the jewel. It is tragic that the son is bereaved of his mother. However, the somber atmosphere is changed by the short, up-tempo development of the story in the second half of drama. Ultimately the piece reaches a bright ending with the blessing of Buddha. This drama cherishes the climax and is artfully woven.